Light and airy holiday apartment with an informal homely feel – suitable for families, couples and golfers. Accessible ground floor with lift access to underground car park. NEWS UPDATE - SPRING 2019 PLANNED IMPROVEMENTS - interior walls painted and new air con system. We love the private garden and shared pool area, with scenic views over the golf course to the hills beyond. This tranquil, green oasis is only a short drive from the hustle and bustle of the coast - Puerto Banus and Marbella are a short drive away. On site, there is the Golf and Country Club’s Clubhouse, open to everyone with an excellent restaurant and bar and a mountainous 18-hole golf course with spectacular Mediterranean views, designed by Seve Ballesteros. In Spring 2019, new owners are making improvements to the Clubhouse leisure facilities including an extended golf pro shop and a new beauticians has opened. This spacious, well-appointed apartment is a semi-detached, end of terrace with a secluded garden. It has home comforts including free WiFi. As one guest has said “it feels like you could be staying at a friend’s house”. The climate in Marbella is mild all year round and some of our guests find the temperatures in late Spring and early autumn preferable to high season. Three furnished South-East facing terraces, one fitted with a sun awning enable guests to make the most of outdoor living. The apartment benefits from air con /heating (new system being installed in Spring 2019), electric storage radiators and towel rails (lounge, master bedroom and bathrooms) for the cooler months. The nearest towns, San Pedro de Alcantara and Benahavis have a decidedly Spanish feel. 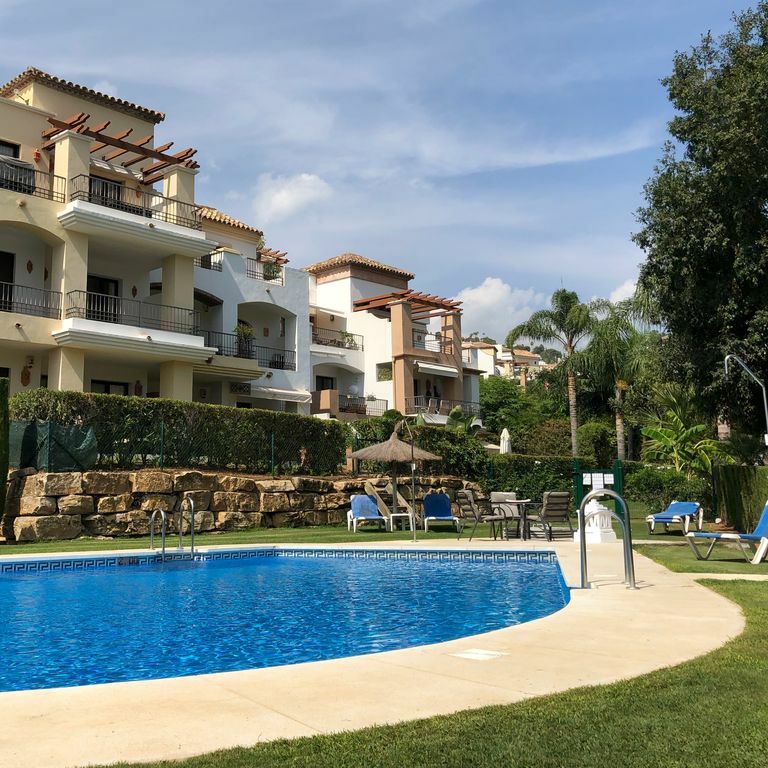 San Pedro offers supermarkets, cafes, bars, restaurants, a boulevard filled with children’s playgrounds and a beach – whilst Benahavis is a hillside town packed with gourmet restaurants. Also close by is Puerto Banus - a millionaire’s playground with its marina, designer boutiques, restaurants and nightlife – and Marbella with its shops and restaurants, beachside promenade and charming old quarter. Independent travellers may enjoy using the apartment as a base to enjoy travelling further afield with day trips or city breaks to the historic Andalusian centres of Ronda, Cadiz, Seville, Granada and Córdoba and Malaga. A hire car is an essential to get around and we can recommend a car hire firm. The nearest airport is Malaga, approximately 40 minutes drive. The apartment has a designated underground car parking space as well as outdoor parking. For your convenience, we accept bookings via Homeaway’s checkout so you can confidently pay by card. If you have any queries - for instance about rental fees for shorter stays than 5 nights, longer-term lets or alternative payment mechanisms – please press “ask the owner a question” rather than “request to book”. Dawn and Rob's professional backgrounds are in marketing/communications and law. Our hobbies and interests include golf, visiting attractions such as museums and art galleries, historic houses and gardens, attending the theatre, reading, shopping and eating out with friends. Los Arqueros is near enough to coastal attractions but a world away, up in the green hills above Marbella. For us, the wow factor of this property is its lovely private garden and hillside views. The apartment is well laid out and has a light and spacious feeling. It's a great retreat to recharge your batteries. As many of our guests have chosen to visit more than once, other people must feel the same way too. With Rob being a keen golfer, the on-site golf course designed by Seve and other championship courses in the area are big attractions too. This is an easy location to get to, being situated within driving distance of Malaga airport. We have travelled extensively in Spain and enjoyed learning about its history and culture and, of course, sampling culinary delights. For independent travellers, we highly recommend using the apartment as a base for day trips in Andalucia or as the second part of two-centre holiday. We highly recommend visiting one of the nearby historic cities (Seville, Cadiz, Granada) or the coast south of Cadiz (Novo Sancti Petri, Tarifa). toilet, combination tub/shower, bidet, 2 sinks (double vanity unit). Heated towel rail. toilet, shower, Single vanity unit with basin and mirror. Heated towel rail. Comfortable dining areas indoors and out. Outdoors seats 6. Indoors seats 4. Breakfast bar with two stools in kitchen. The apartment has marble floors and was originally decorated and furnished by an interior design company. The living room has a 3 seater settee and two armchairs, TV with free to view channels, DVD and CD, a round dining table and 4 chairs. The rooms leads on to a terrace overlooking the private garden. Three terraces are furnished with rattan-style outdoor seating for 4, outdoor dining for 6 and 2 sun loungers. All three bedrooms have built in wardrobes. The ensuite bathroom to bedroom 1 has a bath with a shower, a double vanity unit, wc and bidet. The guest shower-room serves bedrooms 2 and 3 and has a shower, vanity unit and wc. The apartment has air conditioning, heating and heated towel rails. All main kitchen and laundry appliances are Bosch. This is the 2nd time we have stayed in the apartment. The apartment is very welcoming and well appointed with everything you need to start your holiday off. We love the private garden and the close location to the swimming pool. The local restaurants and the shops are brilliant. We love it and will definitely be coming back. This really felt like being a guest in a friends house. The apartment is everything it says in the description and is close enough to everything to be perfect while far enough away to be quiet and restful. The most noise we heard while at the apartment for ten days were golf balls being hit from a tee and occasionally the odd shout of "Fore" (and once something a little more colourful!). The pool is so quiet we were the only people using it and being blessed with great weather (25c most days and sunny) we used it most days. I would recommend this to friends and would certainly hope to return again. A wonderful apartment, well presented and ideally situated for a nice relaxing break. We are a family with two young children and thoroughly enjoyed our break. The apartment is well set and offers a nice layout with excellent out door entertaining space. Great pool which was nice and quiet albeit there are plenty of beds if did get busy, which seems unlikely. Local supermarket is very good and you are very well positioned for the beach, local towns, restaurants etc. Would certainly go back. We had a loverly stay with our two teenage children, the accommodation was very comfortable and we enjoyed the private garden and terrace at the front; leading to the shared pool. The grounds are very well maintained and luscious, with amazing views. Access to Marbella and Puerto Banus was easy by car and Benehavis with its restaurants is only a short drive away. My family and I stayed at this apartment at the end of June 2017 for 9 nights. The apartment is as advertised, smart, very clean and comfortable to say the least. Well equipped, with everything you need. The pool area is quite. with enough sunbeds for all, my boys (twins aged 9) really enjoyed swimming and playing there. It was very quite but this was down to the fact, that the schools had not broken up, we would of like some children around for company for the our boys, but this did not spoil our stay. You really need a car to enjoy all the lovely places to visit nearby, Rhonda, Marbella, Estepona to name but a few. The water park and nearby Selwo zoo are great days out for the kids. Would we stay there again - Yes 100% but just ensure the schools had broken up, this was our error not the apartments. Well kept house and gardens making for an easy and enjoyable stay. Very glad the property had air conditioning which made for an excellent nights sleep. The apartment is well equipped and has a very nice shared swimming pool area. The boys enjoyed the golf course and the Club House is very reasonably priced for good food and drink. Well worth a visit to Ronda (old town) and San Pedro is in easy reach for the Supermarket and has a couple of very nice restaurants in the town. MIjas which is about 45 minutes drive is a beautiful Spanish town with nice shops and good places to eat. Will definitely come again and very happy to recommend this property to stay in. Pleased to hear you enjoyed your holiday and found the apartment to be comfortable and well equipped. Glad you enjoyed different activities - playing the golf course, dining at the club house and visiting nearby attractions. Thank you for recommending this as a place to stay, we hope to welcome you back soon. Golf: Set amidst the Sierra Blanca Mountains, just inland from Puerto Banus harbour, Los Arqueros Golf and Country Club boasts an 18 hole par 72 golf course designed by Severiano Ballesteros. The course requires precision play, especially from some of the narrow tee boxes where drive distance can be sacrificed in exchange for teeing off with irons or shorter woods to ensure that the ball lands on the fairway. The back nine and the club house terrace offer beautiful sea views of Marbella, the Mediterranean and Gibraltar whilst the front nine offers lakes and hills where you may even spot a mountain eagle. The Costa Del Sol has the perfect climate for all year round golf and within a few minutes drive are several quality courses including: La Quinta, Monte Mayor, Aloha, Los Naranjas, Royal Guadalmena, El Higueral, Atalaya and El Paraiso. * Automated booking with payment by card has recently been added for renter convenience and confidence (please note Homeaway apply a service fee which is included in automated quotation) * A non-refundable deposit of 25% of the total holiday cost is required to confirm your reservation (if more than 10 weeks/70 days prior to arrival date) & remaining balance in full is required 10 weeks (70 days) in advance of check in date.